Adventures of a Starving Artist: Worship Wednesdays - Our First Radio Single! we've released our first single to radio! and perhaps one of our favourite cowrites. You can hear a sample of the song HERE. I fell in love with the moving imagery and the sweeping melody. I could picture this young boy with a look of wonder on his face. I imagined a warm breeze moving around him, and the stillness of the night. I announced, "I love it. I can see the second verse. By the way, I'm cowriting this with you." It's not the first time Gerald has heard me say these words. A smile crept across his face. Do not be afraid. There is great news, for all the Earth. A child is born. He's Christ the Lord. Hope of the world. With that, our song was complete. We decided it made a perfect duet, with Gerald singing the 'boy' verse and me singing the 'girl' verse. We created harmonies for the chorus and bridge. This summer, we brought the song into the studio to record. Denny Martin (Nashville) put together a wonderful track using acoustic instruments and lush strings. Carmon Barry (Toronto) painstakingly recorded our vocals to find the perfect mix of performance and emotion. We're so excited about this new adventure. We believe passionately in the message of our songs, and in the power of having Christian music on the radio. We pray this radio exposure gives our music the chance to be heard by a broader audience. 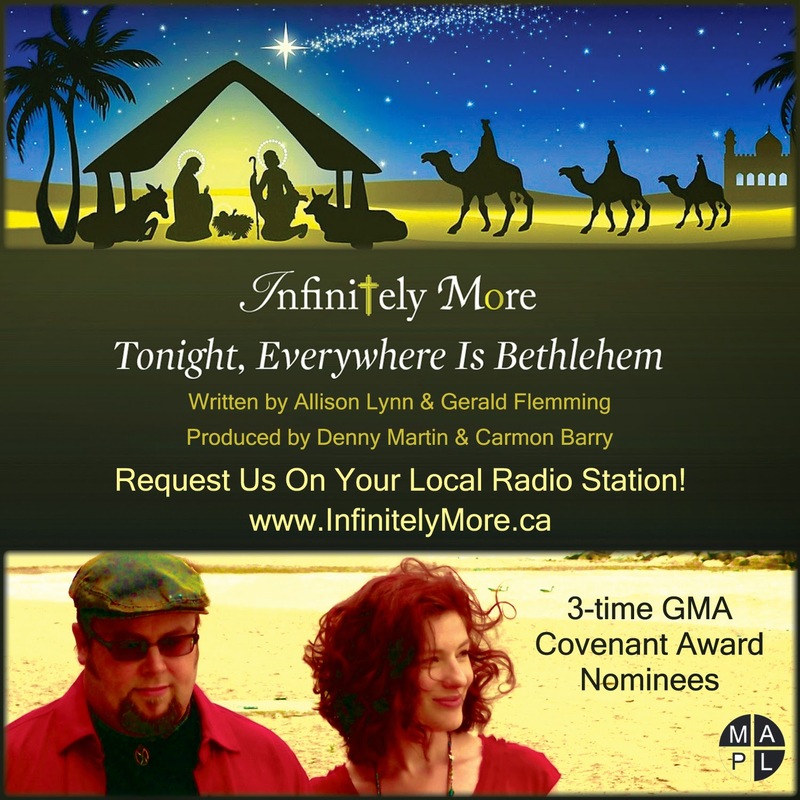 We would love your support in getting Tonight, Everywhere Is Bethlehem out to a larger audience. - Please call or email your local radio station to request our song. - If you work in radio, please contact us for downloads. that it may reach hearts this Christmas season.